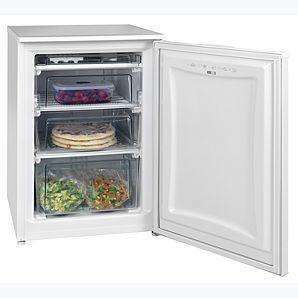 A freezer that matches yesterdays Russell Hobbs Fridge. Not quite such a stonking deal but still very good. Can this be used in the garage? I know a lot of fridgefreezers have issues with thermostatic controls and chest freezers are designed for cold weather. Nearly all domestic freezers sold in UK are designed to operate in ambient temperatures between 10-30C. Is this freezer a frost free freezer ?? - I couldn't find confirmation one way or another. Never knew that, what issues would it cause if it gets colder than the ambient temp? Never knew that, what issues would it cause if it gets colder than the … Never knew that, what issues would it cause if it gets colder than the ambient temp? The modern refrigerants used now are most efficient between 10-30C. Also you will get corrosion and possible electrical problems due to moisture. If you need a freezer in the garage I would buy an older second hand chest freezer and clean the condenser on the back 2 or 3 times per year. Fridge freezers are a no no in garages because when its cold the thermostat in the fridge will cut the compressor out and the freezer will thaw. The modern refrigerants used now are most efficient between 10-30C. Also … The modern refrigerants used now are most efficient between 10-30C. Also you will get corrosion and possible electrical problems due to moisture.If you need a freezer in the garage I would buy an older second hand chest freezer and clean the condenser on the back 2 or 3 times per year.Fridge freezers are a no no in garages because when its cold the thermostat in the fridge will cut the compressor out and the freezer will thaw.Hope this helps. That is true for fridge freezers. A stand alone freezer will deal with an internal garage - mine was minus 15 last year and the freezer was fine.